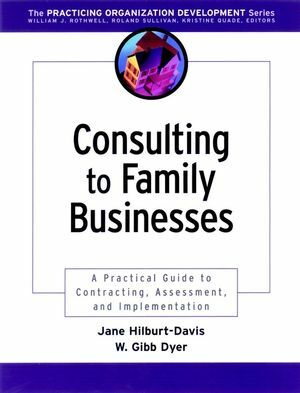 Jane Hilburt-Davis and W. Gibb Dyer-- two of the country's foremost experts in the field of family business-- offer in one comprehensive volume a systematic approach for developing the skills and competencies you need to consult with these unique systems. This practical, hands-on resource shows you how to manage each stage of the consulting process-- from the first contact to the last-- and reveals how to plan strategically and deal with the complex relationship issues that are commonplace in family businesses. Jane Hilburt-Davis is a founding principal of Key Resources, aconsulting group firm that specialized in working with family andclosely-held businesses. Recognized as a leader in the field offamily businesses, she also co-founded the Cambridge Center forCreative Enterprise, an award-winning training and researchinstitute in Cambridge, Massachusetts. W. Gibb Dyer is the O. Leslie Stone Professor of Entrepreneurshipin the Marriott School of Management at Brigham Young University.Dyer is a recognized authority on family business andentrepreneurship. He has been featured in numerous publicationsincluding The Wall Street Journal, Inc., The New York Times, andNation's Business. Part 1: The Family Business System. 1. Why Family Business Consulting? The Development of the Field. 2. Characteristics of "Healthy" Family Businesses. Part 2: Consulting to Family Businesses. Planning Ahead: After the Feedback Session. Additional Tips for a Feedback Meeting. 5. Intervening in Family Firms. Implementation Phase of the Action Research Model. 6. Helping Family Firms Make Developmental Transitions. Transitional DynamicsAssessing the Client s Abilities to WorkThrough Developmental Stages. Part 3: The Family Business Consultant. 7. Skills and Ethics of the Family Business Consultant. 8. Special Situations and Challenges. 9. The Rewards and Challenges of Consulting to FamilyBusinesses.